Staying Alive Baker's yeast prefers warm weather and survives winters in the guts of insects like this hornet, Vespa crabro. What good are ___ ? Fill in the blank with the objectionable life form of your choice — mosquitoes, black flies, slugs, parasitic worms, unnamed things that are too squishy for words. Although the question “Why are we here?” is much trumpeted as a human preoccupation, what most of us really want to know is “Why are they here?” And if “they” are nonhuman (the presence of other people remains a complete mystery), science is pretty good at coming up with answers. All those bacteria that live in and on us, and outnumber our own cells? They help our digestion, fight off bad bacteria and keep us humble. Bats? They eat insects. And in the latest news, researchers have found that European hornets and paper wasps, which pack a sting nasty enough to make anyone question their reason for being, provide a cozy winter home in their guts for one of humanity’s most important microbiological buddies: yeast. The yeast in question is Saccharomyces cerevisiae, sometimes called baker’s yeast, but particularly important in the making of wine, as well as beer and bread. I wasn’t even aware that yeast had a second home until I read about this research. But it does, and now we know where. Humans have been benefiting from S. cerevisiae for at least 9,000 years, but we encounter it mainly in the warmer months — on grapes, or in artificial environments that we have created, like bakeries. But it is a wild life form that was here before we started developing different strains that work better for the kind of fermentation we have in mind. And although it is very common on ripe grapes, no one has known where wild S. cerevisiae spends its winters. 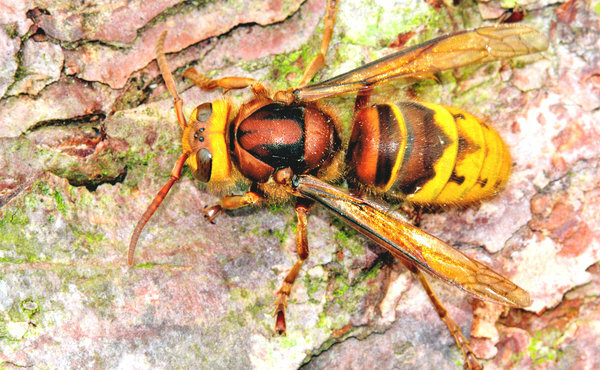 A group of scientists in Italy and France decided to investigate one possibility, social wasps, including European hornets (Vespa crabro) and paper wasps (in the genus Polistes). These insects were known to feed on grapes and to harbor varieties of yeast in their guts. So the researchers, including Irene Stefanini, Leonardo Dapporto and Duccio Cavalieri, all of the University of Florence, conducted several tests on the insects. The wasps did have S. cerevisiae in their guts, and what’s more they had different strains connected to the areas where they lived — perhaps part of the reason wines from different places have different flavors. And yeast does survive over the winter in the guts of the queens who found new colonies in the spring, feeding the young regurgitated food. Thus the young wasps or hornets would acquire yeast from the colony founder and spread it to ripe grapes when feeding. When the harvest was over, the wasps would bring with them yeast that had been living in the vineyards. And if in the process of developing winemaking traditions we developed new strains of yeast, the hornets could keep them alive during the winter. It’s a heartwarming ecological story, and it’s good to have these reminders about hornets, because some of us were once 10-year-old boys who, thinking a hornet’s nest was empty, picked up a stick and took batting practice. And we might harbor unpleasant memories of the hornets that had not abandoned the nest and did not want it to be smacked around. We might think, what good are hornets? I’m glad to learn, finally, that the flying armada that punished my friend and me was actually defending our future wine- and beer-drinking opportunities. That’s one reason to respect other life-forms. You just never know. Maybe the hornets’ nest is empty. Maybe it’s full. Maybe all those insects do is cause us pain. Maybe they’re working on alcoholic beverages you will be able to savor someday in the future. The report on the wasps, in The Proceedings of the National Academy of Sciences, makes one wonder about what other silent partners are out there whose activities have yet to be uncovered. Maybe we just don’t know. Yet.